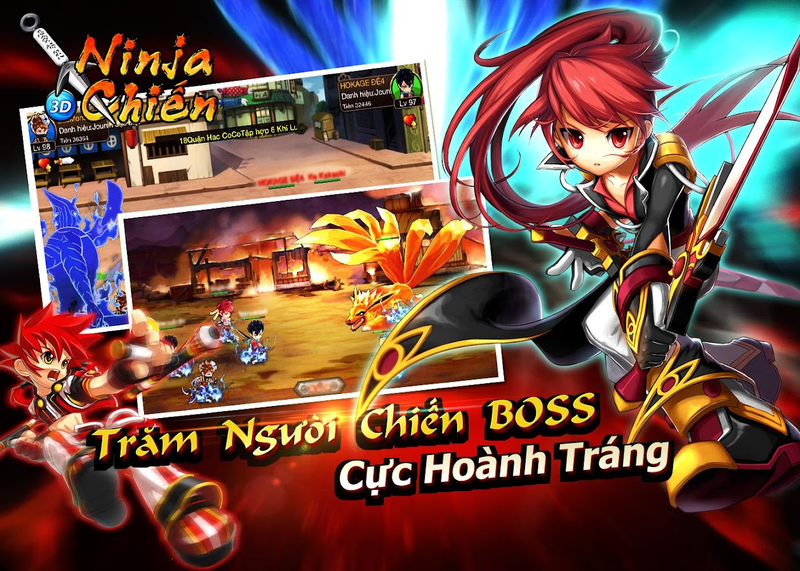 Ninjia Chiến là 1 game chiến đấu phong cách Chibi. 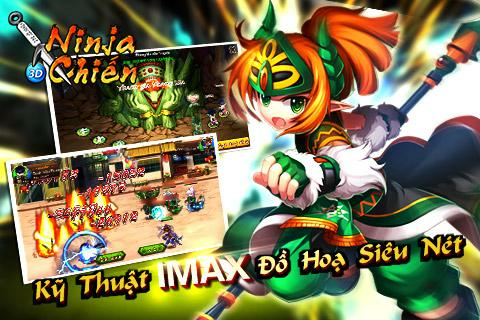 Người chơi sẽvào vai 1 Ninja tân thủ, mục tiêu sẽ trở thành 1 Hoả Anh của cácNinja. 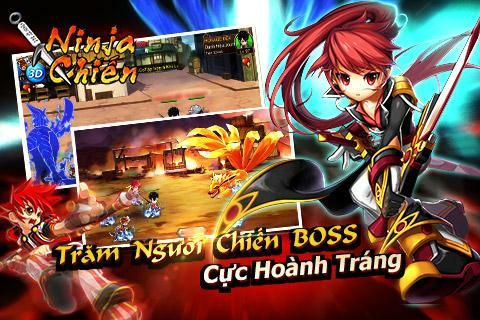 Trong thế giới Ninja có rất nhiều thế lực hắc ám luôn vâyquanh, bạn cần nâng cấp lực chiến bản thân, và đồng thời khôngngừng chiêu mộ bạn đồng hành . 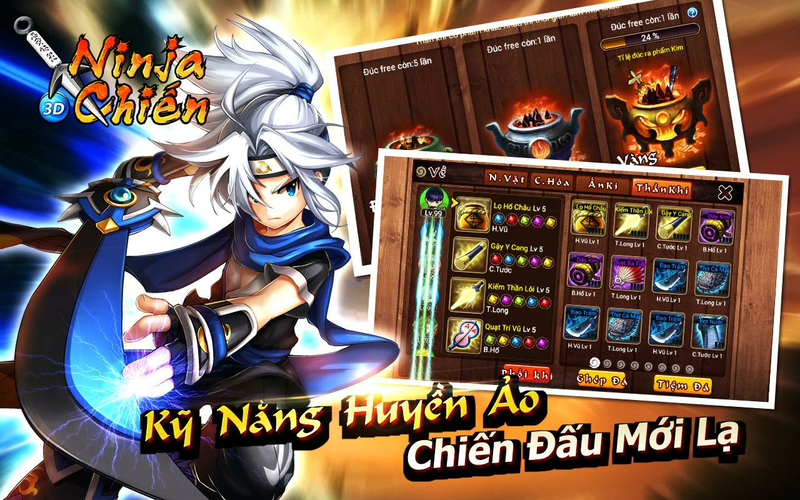 Trong game bạn cần đánh quái qua ải，mục đích tăng cao thực lựcvà PK với người khác，giành lấy danh hiệu vinh dự trong giới Ninja.Cấp bực đánh quái sẽ tăng dần theo bản đồ, cần không ngừng tăng cấpcác yếu tố cần thiết bằng những chức năng trong game. 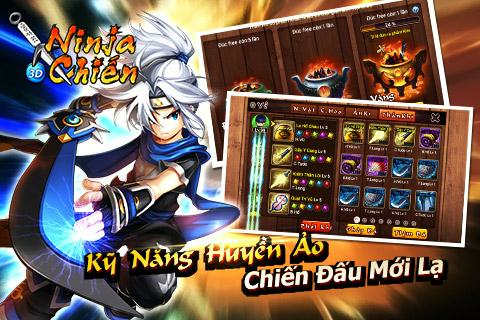 Để có thểchơi tốt game này người chơi cần hiểu rõ và không ngừng trao đổicách chơi mới, nếu không bạn sẽ càng tuột hậu về kỹ năng chiến đấucũng nhưng thực lực. 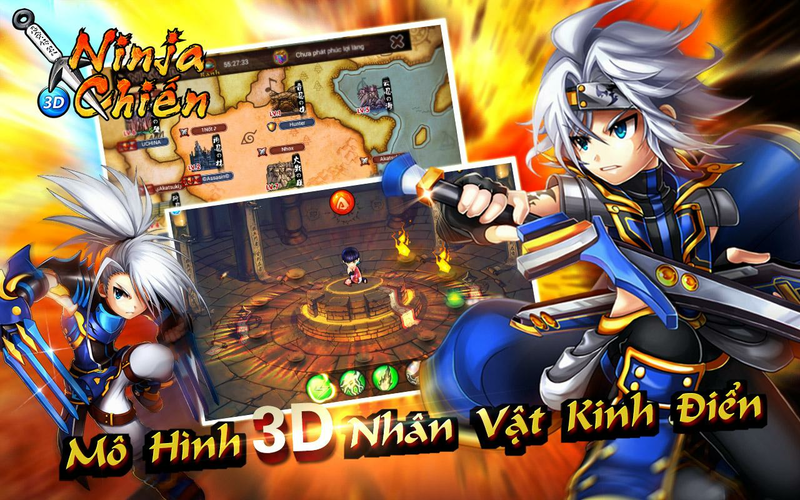 Battle Of Ninja is one of the best 2D animeninja battle game. 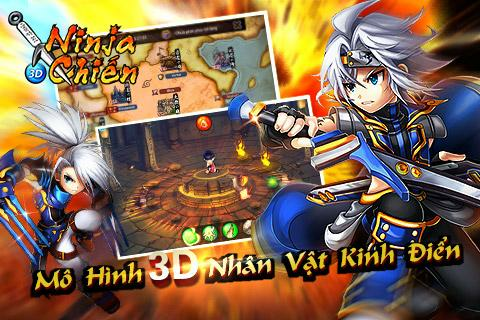 Let play this game with your favourite shinobininja from Konoha and defeat Akatsuki group.Features:- Easy to play, very addictive.- A lot of characters base on famous ninja: Sasuke , Itachi ,Kakashi ...- Special jutsu: rasengan , sharingan , susanoo, chidori .... withbeautiful effect.How to play:- Tap Left / Right to attack. 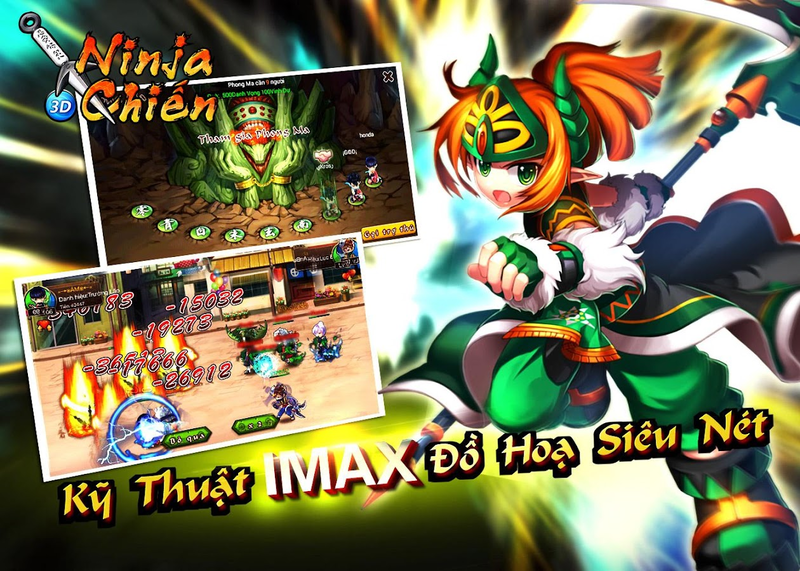 Time your attacks, you can't hitenemies from too far away- Use Kunais and your Jutsus to kill the enemies and gainmoneyFor any contribution, please feel free to contact us via email:[email protected] sure to like our fanpage for naruto fan to always receive thelatest updates and more information/tips about the gameplay:https://www.facebook.com/Naruto-Battle-Of-Ninja-817751728353923Have fun playing!!! 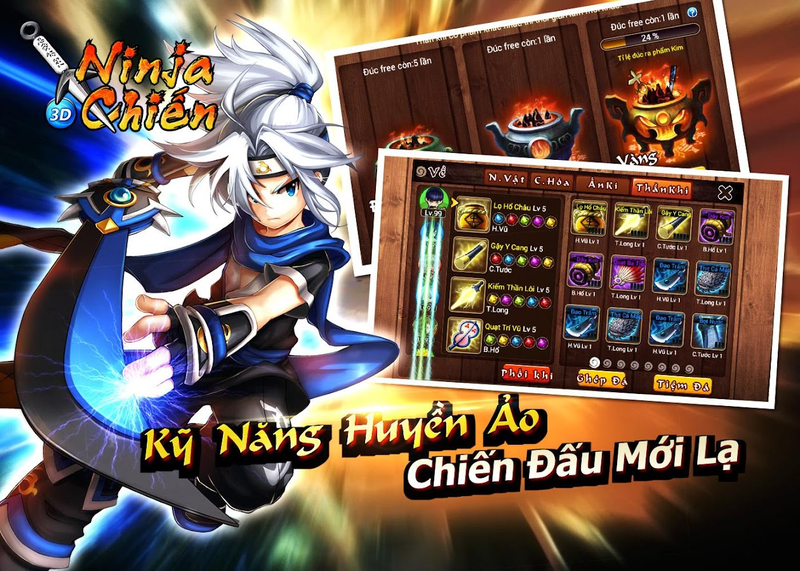 Fire will, inheritance by you!Homage to classic blood boiling, swim card player "ninja world"sincerity online!Fire will, inheritance by you!Japanese painting represent the ninjaworld, fetter entanglements a repeat of fate, the original cartoontheme mobile game, accompany you to the next 15 years!The game features:The original scene, acme reductionPerfect reproduce anime classic drama, from the ninja school teamto the first task, to endure the exam together enemies, scenes,step by step, take you to revisit, retrieving had moved. 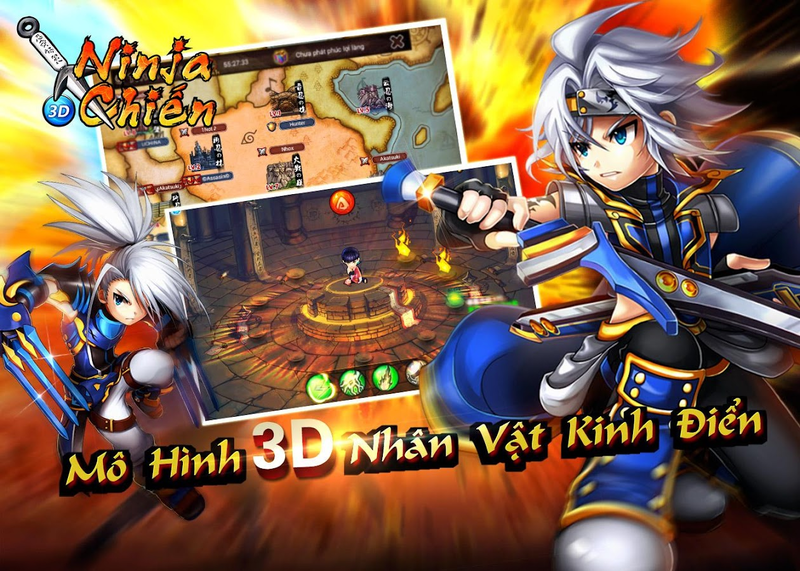 Popular 2D VS fighting game "THE KING OF FIGHTERS-A 2012" returnsas a free app to celebrate KOF 20th Anniversary!■NEW CHARACTERS,NEW TEAMSIn addition to the characters from he previousinstallment, the 4 new “ART OF FIGHTING”, “PSYCHO SOLDIER”, “KIM”,and “IKARI” teams (12 new characters), join the cast of "KOF-A”! !You can now create your favorite team from this formidable rosterof 32 fighters!■A SINGLE-PLAYER MODE RICH IN CONTENT6 game modesare available for thousands of hours of enjoyment even when playingalone: “SINGLE BATTLE” for 1-on-1 fights, “TEAM BATTLE” for classicKOF 3-on-3 gameplay, “ENDLESS” Mode to defeat as many opponents aspossible with one character, "CHALLENGE" Mode to clear trials byfulfilling requirements, the newly introduced "TIME ATTACK" Mode tocompete for the best clear times by winning 10 matches, and“TRAINING” Mode to get accustomed to the Virtual Pad-based controlsand practice your combos.■SIMPLE COMMANDSThe Virtual Pad recreatesperfectly reproduces KOF’s smooth controls. Even novice players infighting games will be able to release various Special Moves, SuperSpecial Moves, NEOMAX Super Special Moves, and other complex movesin one touch. With the Simple Commands, you can easily perform manyof the game's fancy combos!! *Please refer to "TUTORIAL" Mode for anexplanation of these commands.■ADDITION OF TONS OF NEW TRADINGCARDS, ILLUSTRATIONS, AND OTHER EXTRA CONTENTPlenty of new TradingCards (that can be acquired by using points earned during gameplay)along with new Illustrations (which can be viewed at any time byfulfilling certain conditions) have been added to this latestrelease! Moreover, "KOF-A 2012(F)" includes rough sketches andillustrations that can only be seen here, which fans cannot affordto miss!©SNK PLAYMORE CORPORATION ALL RIGHTS RESERVED. The popular television show "Satria GarudaBIMA-X" is now an action game!Play as both Satria and their enemies! 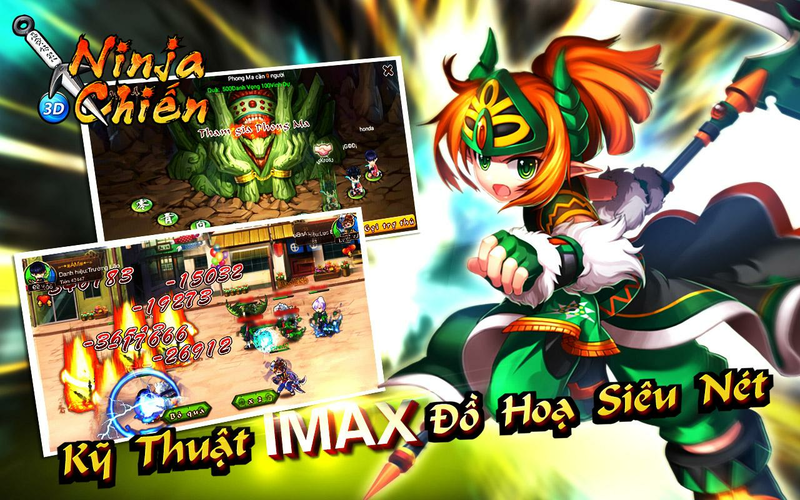 Enjoy one-on-one fightingaction using your favorite characters!---Aim for the top in single-player mode!---In this mode, you can fight with your favorite character againstone computer opponent after another.Select from five levels of difficulty: KIDS, EASY, NORMAL, HARD,and VERY HARD, making it accessible to everyone from beginners toexperts!---Play against friends in Versus Mode! 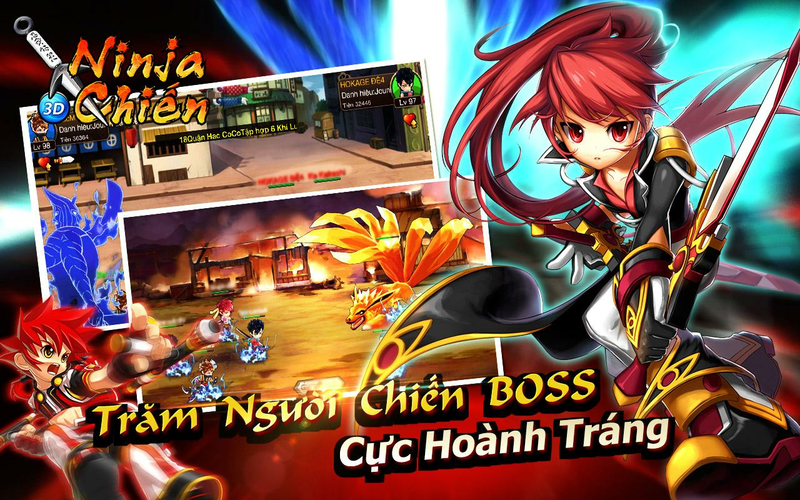 !---In this mode, you can play against nearby friends usingBluetooth.Use your favorite characters and try to reach 10,000 wins!---Try Challenge Mode! It's more than just winningbattles! !---In this mode, you move around a map completing challenges for eachstage.Earn new characters by reaching a certain number of combos ordefeating powerful opponents!---How to Play---Playing is simple! Perform moves by tapping the Punch, Kick and EXbuttons.Combine these with the directional buttons to pull off a variety ofspecial moves.Anyone can easily perform impressive moves from the show just bytapping the SP button. Try making your own original combos!Recommended OS version:Android 4.0.3 and upAbout data usage:Downloading or updating the game can use large amount ofdata.Make sure you are in a location with a good connection before youstart.Disclaimer:1. Use of this app on anything other than the recommended devicesor OS versions is not supported.2. Depending on the usage conditions, the app may not perform in astable manner even using the recommended devices.3. Even if the app's requirements read "Android x.x and up" it doesnot necessarily mean that the app is compatible with the latestversion of the OS.http://bnfaq.channel.or.jp/contact/faq_list/1707[Terms of Service]http://legal.bandainamcoent.co.jp/terms/©2014 RCTI/ISHIIMORI Production Inc.©2015 BANDAI NAMCO Entertainment Inc.
Get Ready for the Holidays with Google Play's Festive Updates WarRobots is an action-packed multiplayer game with 6 vs. 6 teambattles in real-time! It's a time of war, pilot! Are you ready forsurprise attacks, intricate tactical maneuvers and the many sneakytricks your rivals have in store for you? Destroy enemy robots,capture all the beacons, and upgrade your weapons to increasecombat strength, speed, and durability of your battle robot. Proveyourself in each map and use different strategies and tactics toemerge victorious from battle! MAIN FEATURES: – 48 battle robotswith different strengths; – more than 50 weapon types, includingballistic missiles, energy and plasma guns. What will you choose? –many possible combinations of robots and weapons. Create a warmachine to fit your own play style; – create your own clan and leadit to glorious victories; – join epic PvP battles against rivalsfrom all over the world; – complete military tasks for bonuses andearn the Best Pilot title. Onward, soldier! Victory is yours! Wantto talk about the game or find allies? Join us on Facebook:https://www.facebook.com/warrobots/ Follow us on Twitter:https://twitter.com/WWR_by_Pixonic Watch new videos on YouTube:https://www.youtube.com/user/WALKINGWARROBOTS Find all about WR onour Knowledge Base: http://faq.wwr.mobi/hc/en-us/ Important note:This application requires a stable internet connection. Enjoy thegame!